As an alternative to traditional metal braces, Invisalign® can be a discreet option to gradually straighten your teeth. This technique is popular with many adult and teenage patients requiring orthodontic care, as older patients often dislike the idea of wearing noticeable metal braces. Utilizing a series of customized aligners, Dr. Robbi Wilson, our licensed Invisalign® dentist, can provide you with a comfortable and aesthetically-pleasing solution to correct overbites, underbites, crossbites, or other tooth alignment issues. If you would like more information about Invisalign®, or if you would like to schedule a consultation at our office, please contact Pomerado Cosmetic Dentistry today. 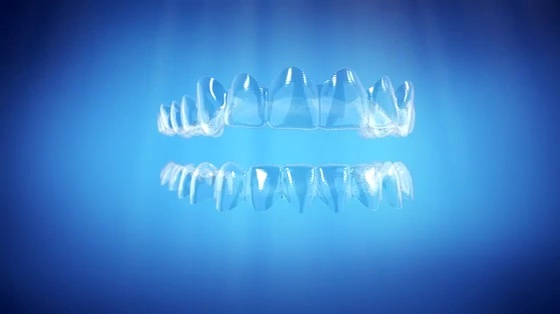 Invisalign® utilizes a series of customized, removable trays to improve teeth alignment. The trays are made of a clear plastic material, helping to provide a more comfortable and discreet treatment process. The design of each tray is slightly different from the one that comes before it, allowing for a gradual repositioning of the teeth over time. At Pomerado Cosmetic Dentistry, Dr. Wilson will begin the Invisalign® process by designing and creating your clear aligners from a computer-generated, 3D image of your teeth. The number of trays needed to complete the straightening process will vary depending on your specific needs. Once the series of aligners has been created, you will be instructed on how long each tray should be worn in order to gradually shift your teeth into the desired positioning. Throughout the Invisalign® process, you will need to return to our office approximately every four to six weeks so Dr. Wilson can check your progress and replace your aligners with a new set. These appointments are typically fairly brief and should not take much time out of your day. The aligners should continue to bring the teeth into better alignment over the next several months. Once optimal results have been achieved, the aligners will no longer need to be worn. While most patients complete the entire Invisalign® process in about 9-12 months, you could potentially achieve your desired results in as little as six months, depending on your individual situation. With that in mind, it’s important to remember that the length of time for optimal results is dependent on each patient’s unique needs and the extent of the orthodontic concerns being treated. Individuals with less severe alignment or bite issues can often complete the treatment faster than those with more complex orthodontic problems. Even so, one of the major benefits of Invisalign® is its ability to correct common concerns in a shorter amount of time when compared to other orthodontic procedures. Invisalign® clear aligners are quickly becoming one of the most popular options available to straighten the teeth, improve bite issues, and correct a range of common orthodontic issues. Ultimately, Invisalign® is an investment in the function and appearance of your teeth that can continue to pay off for decades to come. In addition, the cost of Invisalign® is often comparable to braces, while offering a more discreet alternative to more traditional orthodontic treatments. Since Invisalign® is a procedure that is customized for each individual patient, the overall cost of the treatment varies depending on one’s unique needs and goals. Contributing factors include the extent of treatment necessary to address your concerns, the number of aligners required, and the projected length of time it will take to achieve optimal results. When you come in for your initial consultation here at Pomerado Cosmetic Dentistry, one of our experienced cosmetic dentists will perform a comprehensive oral examination and determine whether Invisalign® is the best option for you. If you are a candidate for Invisalign®, we will create a treatment plan designed to meet your needs with the best possible results. A member of our team can then come up with an estimate of the overall costs of Invisalign® and talk with you about your payment options before you decide to have the treatment. Many dental insurance providers offer at least partial coverage for orthodontic treatment. Our practice accepts all PPO dental plans. For those who would like to offset the costs of treatment in other ways, we work with CareCredit® Financing, a respected healthcare financing company that offers a range of low- and no-interest monthly payment plans for qualified applicants. Pomerado Cosmetic Dentistry also accepts a wide array of payment methods to make the process as financially convenient as possible. We will work with you to find the best solution for your needs. Learn More About Our Payment and Financing Options here. For patients who may not be candidates for Invisalign®, as well as for those who would simply like to explore other options for orthodontic treatment, our practice offers a number of alternatives that can also correct the appearance of teeth misalignment. Individuals who are affected by gaps and spaces between their teeth and other alignment issues can often benefit from porcelain veneer treatment. Porcelain veneers are custom tooth restorations designed to fit naturally and comfortably over the affected teeth. This treatment can be very effective at creating a healthier, more even appearance to the teeth. Removable orthodontic retainers offer another option for correcting teeth misalignment. A retainer can address spaces between the teeth as well as areas of crowding, helping to bring the teeth into a straighter, more uniform position. During your initial consultation, our dentist can talk with you about the many effective orthodontic options we offer that may be ideal for your needs. Are you considering Invisalign®? If you have questions regarding this advanced orthodontic treatment, or if you would like to schedule a consultation, please contact Pomerado Cosmetic Dentistry today.